If you were stranded on a dessert island and could only take two things, what would they be? I’ve always had such a hard time answering that question. I mean, let’s just first rule out people. The point of being stranded on a dessert island is to be alone, not wiping noses or driving carpool, am I right? Okay, so once we stop feeling guilty for not saying our wonderful children should go with us, we still need to decide. Food? Comfort? Technology? I would probably be driven mad without my phone. Or a TV. But, what it all comes down to, for me, is food. I think I could survive if I had a book and some bread and some dessert. Just bread and dessert…I’d get bored. I need a book (or four). What’s a girl to choose? This pie could help me with this dilemma. I love me some bread. Like, we’re super BFFs. I’ve been known to polish off an entire loaf of sourdough all by myself. When I’m planning a meal, the carb is the first thing I think about. Especially at Thanksgiving and Christmas. The rolls are The. Most. Important. Thing. Well, except for my cornbread stuffing. But, then again, that is 90% cornbread. So…same thing. I was very, very excited to try biscuits from Robinhood Meetinghouse. I mean, it’s a perfect fit. These layered cream cheese biscuits are, seriously, some of the BEST biscuits I have ever eaten. They are all natural, with no trans fats, and they are the fluffiest, densest, most pillowy things you’ll ever eat. The box they sent me had 24 biscuits in it. They come frozen, and all you do is pop them in the oven for 25-30 minutes to bake them up. Can I tell you that the box of 24 biscuits weighed 4lbs? Yeah. They are that good. I made a bunch for dinner one night, but as usual my eyes were bigger than my stomach. 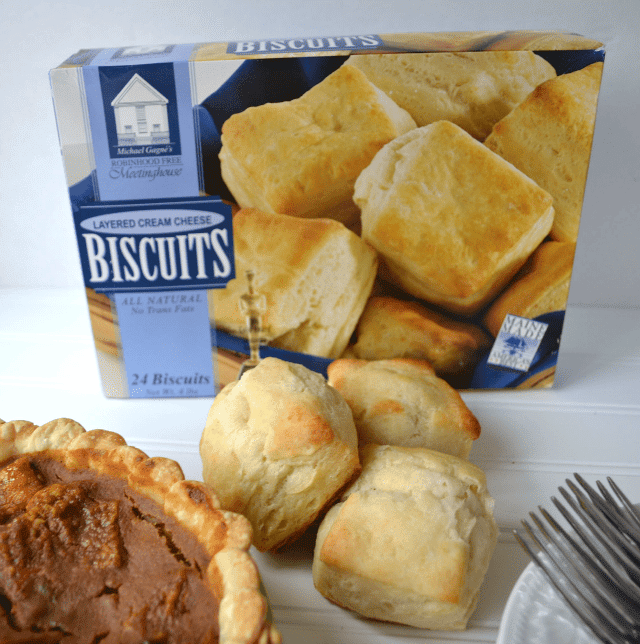 These are some serious biscuits; one goes a long way. What do do with leftover biscuits? Bread pudding immediately came to mind. But, we are in the middle of the #2weeksofpie. 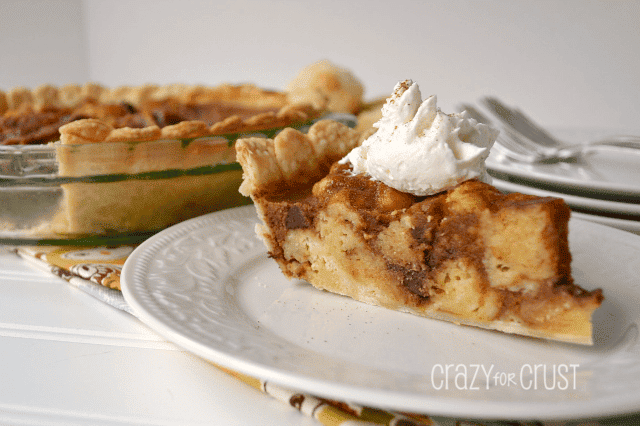 How to combine bread pudding into a pie? This pie is full of pumpkin flavor. 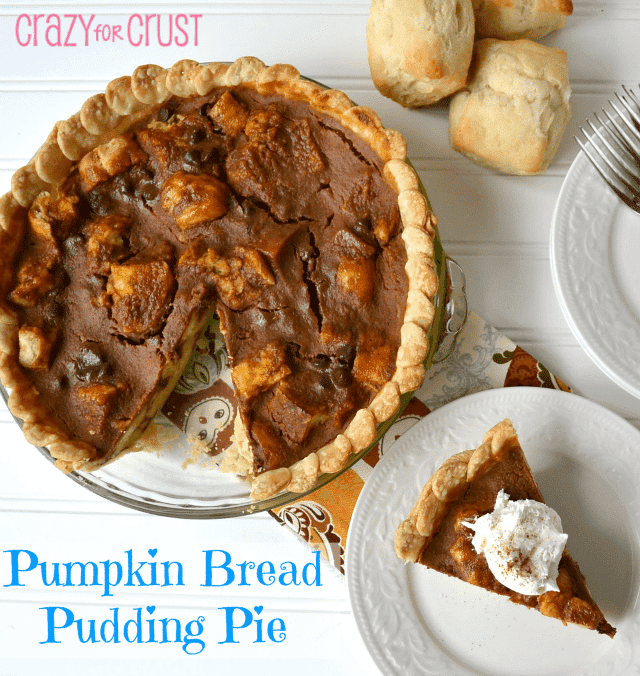 It tastes like a pumpkin pie but is denser and chewier, something I love because, well. You know me and my food issues. I wanted to make a crust from scratch. I did, the first time I made this pie. But the filling didn’t work. So I had to make it again – and the second crust failed. At that point I was too tired to make crust for a third time, so I used a box crust. But you know what? That’s okay. I love a boxed crust, and they are easy, fast, and delish. You know what else Robinhood Meetinghouse makes? 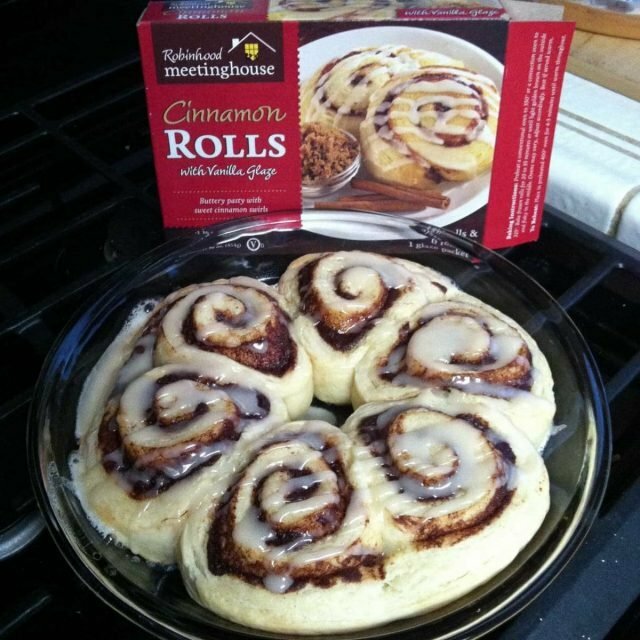 They make cinnamon rolls. That taste like sugary sweet biscuits. Ohmigod they were so good. So…if I was stuck on a dessert island, I’d bring a book. And maybe this pie? It has both bread and dessert. Kinda fulfills both requirements, methinks. Line a 9 or 9.5” pie plate with pie crust. (My pie plate was 9.5” which is a little too big for the store-bought crust. So I used the second crust to create a design around the edge. I used a 1M tip to cut out circles - using the back end of the tip - to place around the edge of the pie. You could also use a mini cookie cutter. If you are using a 9” pie plate, one crust will work fine.) Place in the refrigerator until ready to fill. Place brown sugar, eggs, milk, pumpkin, spice, and vanilla in a large bowl. Whisk until combined. Let sit for 10 minutes. Place biscuit chunks and chocolate chips on top of your prepared crust. Pour the filling over the top, using your fingers to work the mixture in between all the chunks of biscuit. Let sit for 30 minutes before baking. Preheat oven to 350 degrees. Bake for about 40 minutes, until filling seems set. If the crust seems to brown too quickly, you can cover it with foil. Let cool before slicing, store in refrigerator. My favorite part of Thanksgiving dinner is the mashed potatoes, but I prefer dessert over any part of the actual meal. My favorite part of Thanksgiving dinner is definitely dessert!! (Followed closely by stuffing) This dessert is genius!! 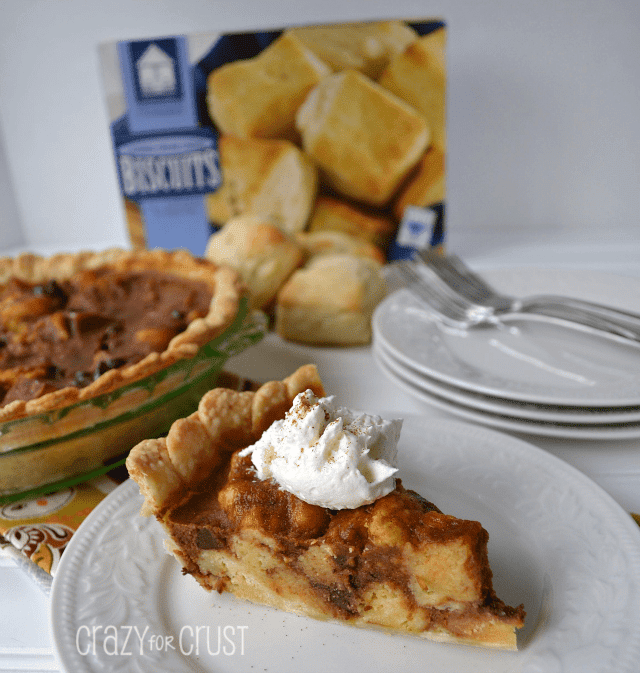 Bread pudding in a pie?? So cool. Love it! my favorite part is the stuffing and pumpkin pie. It is the only time of year we have them! Can i say my favorite part of thanksgiving is leftovers the next day?? I make a stuffing with half german dark bread, fennel, celery, chestnuts, onion and sage that is almost better the next day! Love the food and having my college kids home.